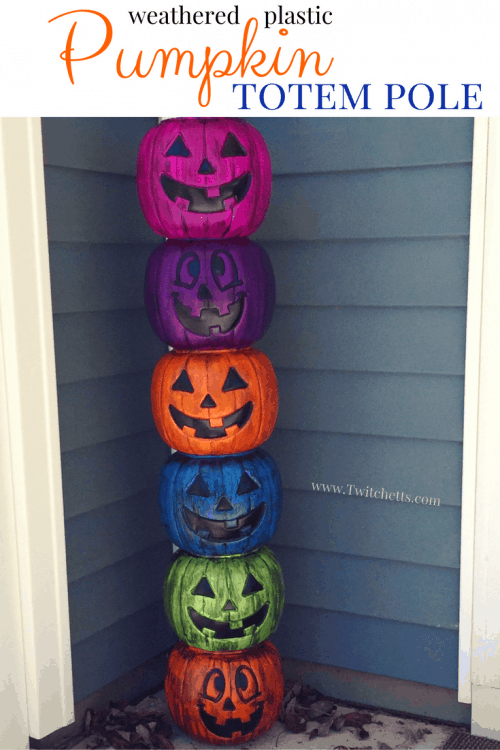 Create an amazing plastic pumpkin totem pole for your front porch. 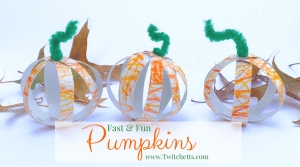 Turn inexpensive plastic pumpkins into Halloween decorations that wow! 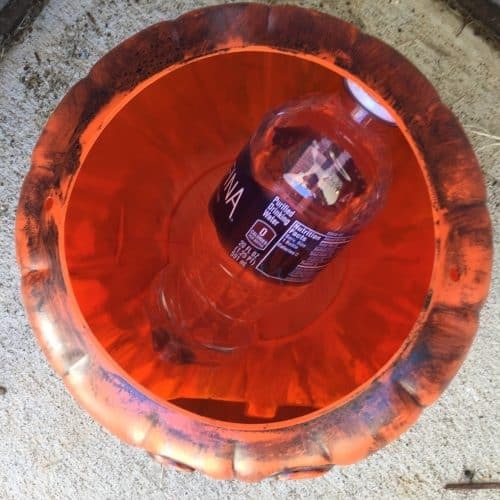 You know those bright and cheap plastic pumpkins you always see at the store? The pumpkin pails that are only about $1 a piece? 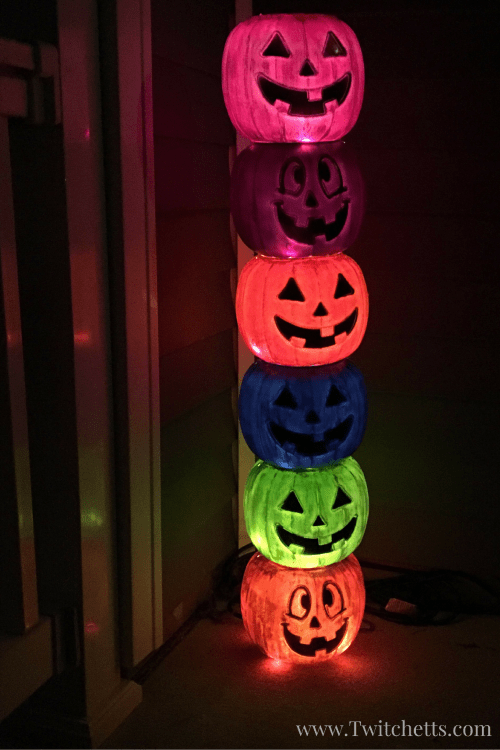 What if I told you that you can turn those fake pumpkins into an amazing plastic pumpkin totem Pole?! 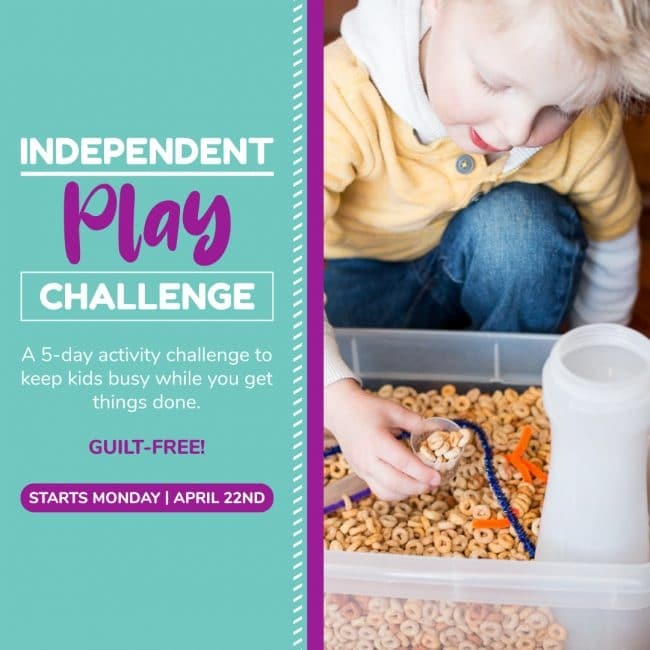 I am a huge fan of quick and easy decorations. The idea of having to store large decorations for an entire year is not appealing. 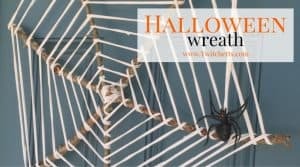 While this one isn’t quite as cheap as the Spiderweb Wreath, it won’t hurt your wallet and can be created in an afternoon. You can leave it up all season, and then toss it when the snow starts falling. 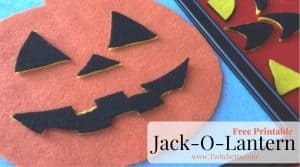 Related Craft: Instead of jack-o-lanterns, you can create a weathered look on white plastic pumpkins! Cheap plastic pumpkins handle removed. Pour yourself a little bit of the black ink, have your foam brush handy and a few dampened paper towels. You want the paper towels wet, but not dripping. 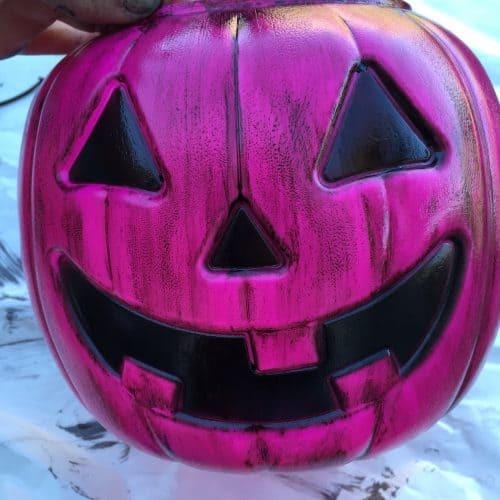 Start by painting with your ink down the creases of the pumpkin. Then add a light coat over the whole thing. You won’t need much ink. Usually, one dip of the brush can cover the whole pumpkin! 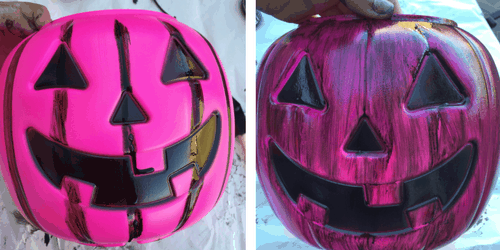 Paint in vertical strokes and make sure to add the ink all the way up to the rim of the plastic pumpkin. 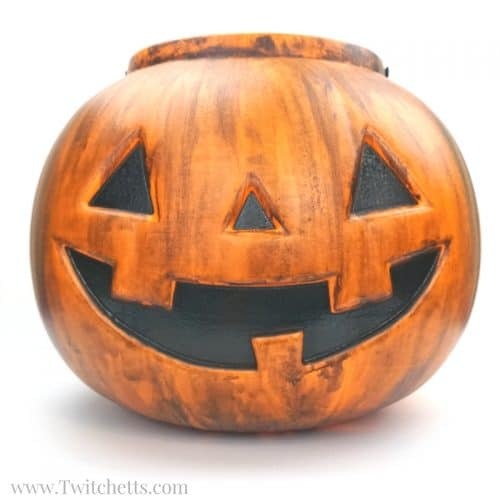 Once your pumpkin pail is covered, immediately take your damp paper towel and wipe off most of the ink. Use a downward swipe from the top to bottom. Work your way around the entire pumpkin. Then start the next pumpkin! Check out just how easy this technique is as I weathered this large pumpkin in the video below! 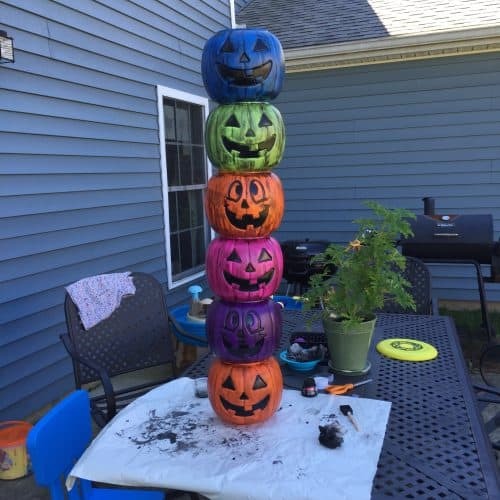 Play around with the color order of your pumpkins until you like your stack. Place something heavy in the bottom pumpkin. We refilled a used water bottle and threw it in there. If you are placing yours somewhere that might get a lot of the wind you could add a few bricks. 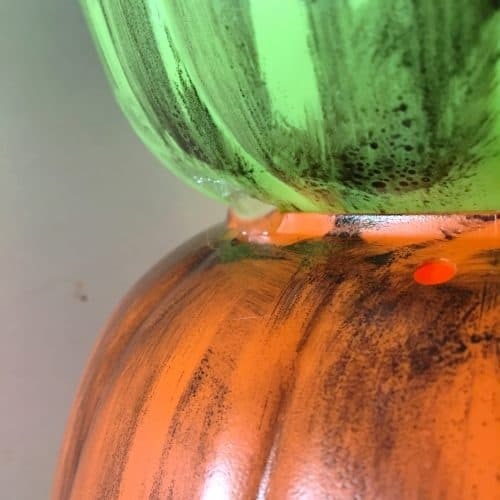 As you stack your pumpkins add a few beads of hot glue around the seam where the two pumpkins meet. 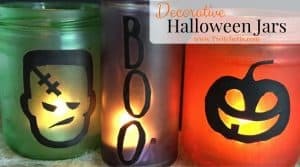 Again, depending on your location of the decoration is how much glue you will want to use. This thing is seriously cute! 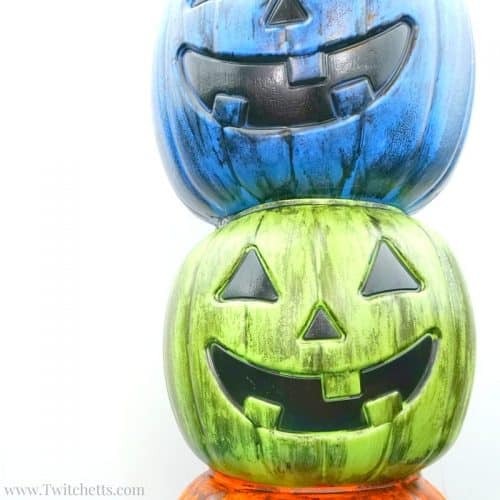 Finally, find a good spot for your weathered plastic pumpkin totem pole! Since my kiddos are still pretty young we don’t do too many scary Halloween decorations so this works out perfect for our family. 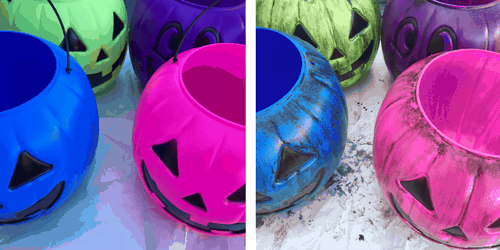 Take your pumpkin pail decoration up a notch! 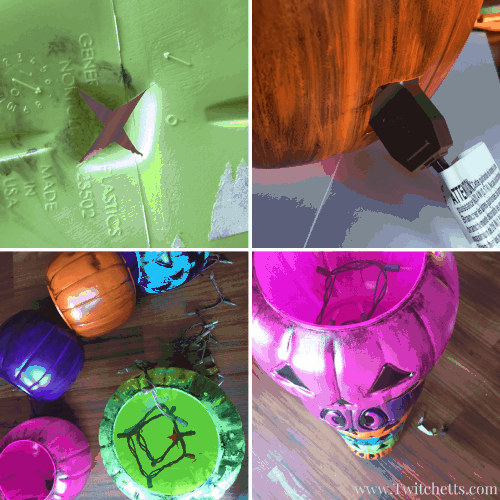 This was My Man’s idea so I have to give him credit… Using an Exacto knife, I cut an X in the bottom 5 of the 6 pumpkins. Then one whole out the back of the one at the base. Add in some white lights and bingo… It glows at night!